The Aberdeenshire Design Awards are a bi-annual event that recognise good quality projects, chiefly architectural, located within Aberdeenshire. A project must be of a high standard to be considered for a design award. It must show exceptional merit and be of a quality that justifies more than local attention. There are three tiers of design award: commended, highly commended and distinction. 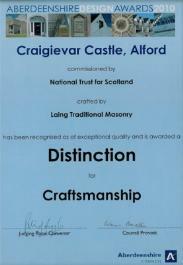 Craigievar Castle was awarded a Distinction for Craftsmanship and Highly Commended for Conservation. The Viewing Pavilion in Ellon was Commended for Rural Landscape Design. Salmon House, Portsoy was awarded a Distinction for Conservation and received the new Ian Shepherd Award in memorial to the former principal archaeologist in the local authority.